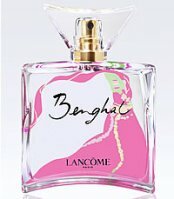 The next fragrance from Lancome's Collection Voyage (see Tropiques, the first in the series) will be Benghal, inspired by India. Upscale British jeweller Theo Fennell will launch his first fragrance, Theo Fennell Scent, in February 2007. Update: Theo Fennell Scent was developed by perfumer Christophe Laudamiel. (via Women's Wear Daily) Theo Fennel Scent is available at Harrods in 75 ml Eau de Parfum and 15 ml Parfum. It's a Chypre-Oriental – powdery, feminine and quite animalic but unlike Black Orchid which was too dirty for me, this one mellows down with my skin, from a rose, lily and orchid to jasmine and sandalwood.. mmmmmm!